This rarely-seen film from director D.W. Griffith stars Clarine Seymour and Richard Barthelmess in a South Sea tale of culture clashes and redemption. Barthelmess plays well against type as a gin-soaked ne’er-do-well, and Creighton Hale is perfectly cast as a well-to-do but sickly American visitor to the South Seas island. Seymour is personable and pleasing as their vivacious native love interest (although her ‘old heathen dance’ is ludicrous to modern eyes). Pointless villlainy is perpetrated by Anders Randolf, and judgmental piousness by George MacQuarrie. Director Griffith treads familiar ground for his climactic sequence as the ‘good guys’ are trapped in a small building surrounded by threatening forces, helplessly hoping for a miracle rescue. (To see the point, compare this sequence to those in The Battle at Elderbush Gulch and other Griffith nailbiters.) The film meanders around class and race relations, and the single-mindedness of western religious missionary work, but never quite makes a straight-forward point. On the flip-side, Florence Short’s over-the-top performance as Pansy, a hyperactive South Seas native, is a hoot-and-a-half and the more comic than threatening Walter James, a headhunter native chief with a bone through his nose, looks as though he’s wearing a brasier made of human skulls. The film is OK as a formula South Seas tale (to be followed by similarly themed films such as Hula and Sadie Thompson) but is ultimately an aimless soaper that is possibly only saved by the unintentional comedy. with The Mountaineer’s Honor (1909), black & white, 13 minutes, not rated. Grapevine Video, no catalog number, UPC 8-42614-10119-9. One single-sided, single-layered, Region 0 NTSC DVD-R disc, 1.33:1 aspect ratio image in full-frame 4:3 (720 x 480 pixels) interlaced scan MPEG-2 format, 4 Mbps average video bit rate, 224 kbps audio bit rate, Dolby Digital 2.0 mono sound, English language intertitles, no foreign language subtitles, 8 chapter stops; standard DVD keepcase, $19.95 (reduced to $14.95). Ratings (1-10): video: 4 / audio: 3 / additional content: 3 / overall: 3. 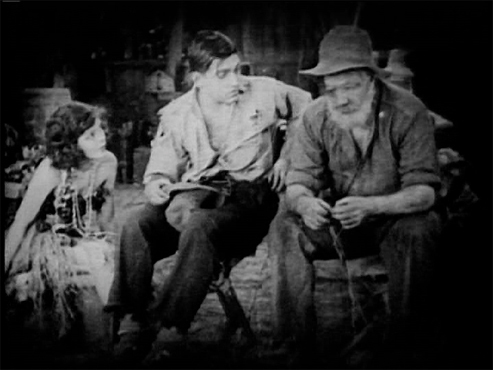 This DVD-R edition of the rare D.W. Griffith film has been mastered from very-good 16mm reduction print materials. The low-resolution analog video master is coarse and full of image compression artifacts that are obvious on a high-resolution monitor. The reasonably good print materials could benefit from a higher-resolution disc remaster. The film is accompanied anonymously by a muffled electric organ and piano music score. While this is not a great disc, it is watchable and is the only known home video edition of the film. USA: Click the logomark to purchase this Region 0 NTSC DVD-R edition from Amazon.com. Your purchase supports the Silent Era website. Other silent era D.W. GRIFFITH films available on home video. Other silent era RICHARD BARTHELMESS films available on home video.